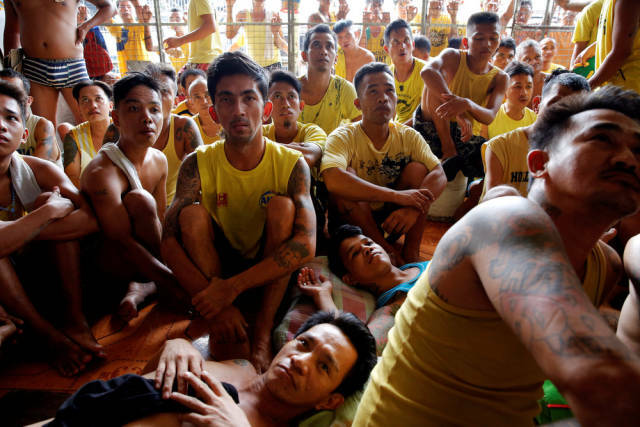 Since the drug war has intensified in Philippines after Duterte took office in June, all of the jails got extremely overcrowded. There are even people who are not convicted yet but have to wait on their trial in these prisons. 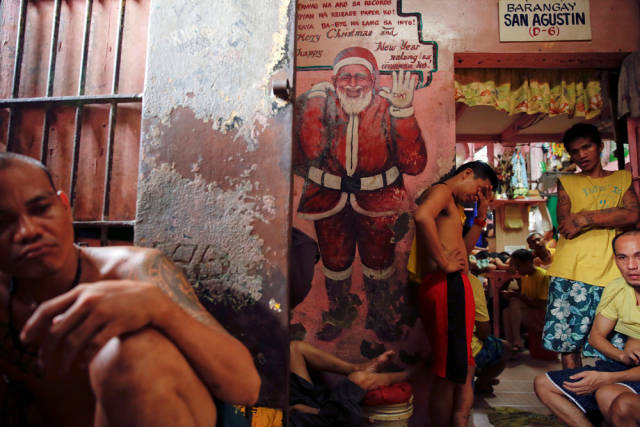 Quezon City Jail in Manila is one of these overcrowded prisons. It can normally hold 800 inmates but currently, there are about 4,000 detainees in there. Almost most of them imprisoned on drug charges. 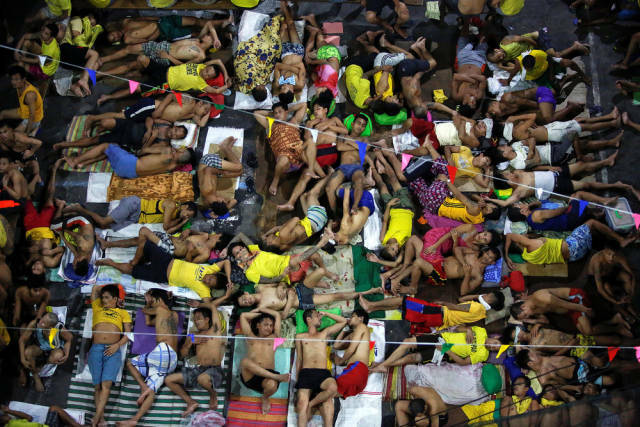 Inmates sleep at Quezon City Jail in Manila, Philippines November 5, 2016. 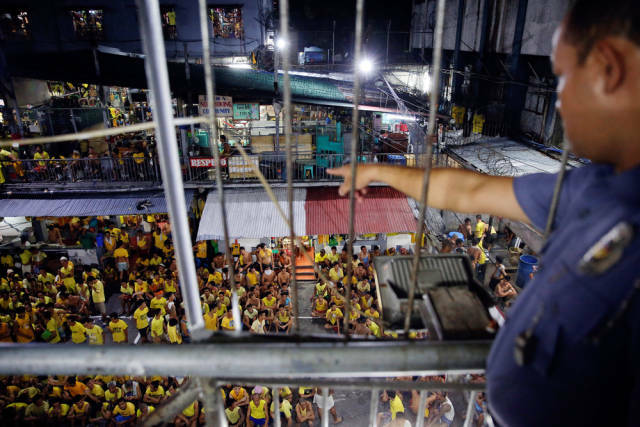 A guard points at inmates gathered at the basketball court for a head count before going to sleep at Quezon City Jail in Manila, Philippines October 18, 2016. 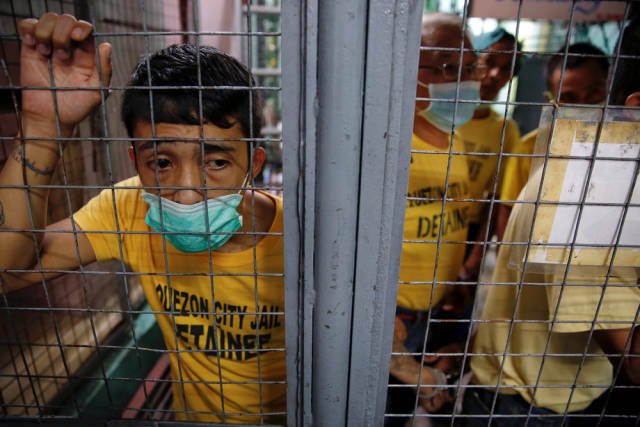 Inmates wait to be taken from Quezon City Jail to court hearings in Manila, Philippines October 19, 2016. 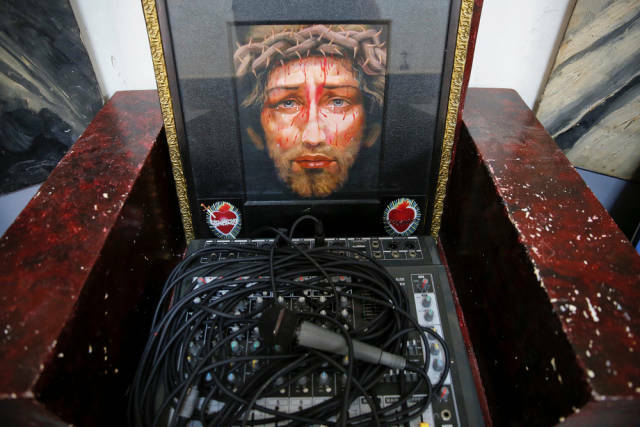 A religious picture is placed next to a microphone and sound system at the chapel of Quezon City Jail in Manila, Philippines October 19, 2016. 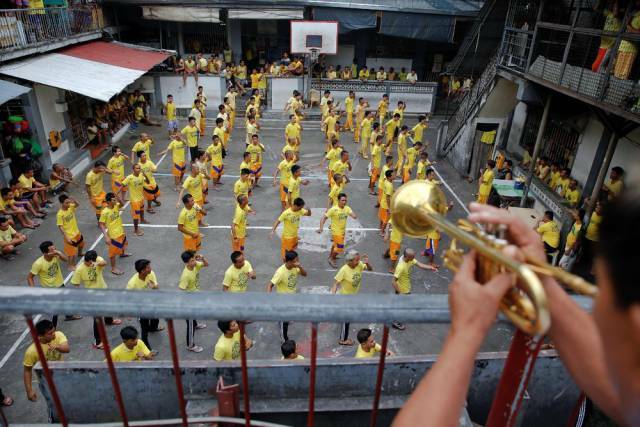 Inmates dance during routine morning exercise at the court inside Quezon City Jail in Manila, Philippines October 19, 2016. 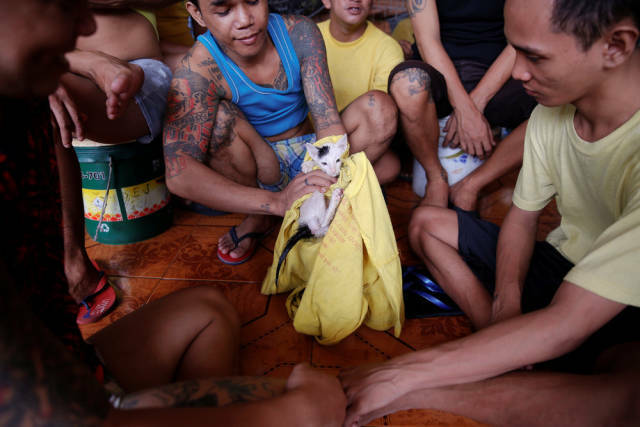 Inmates play with a cat at Quezon City Jail in Manila, Philippines October 19, 2016. 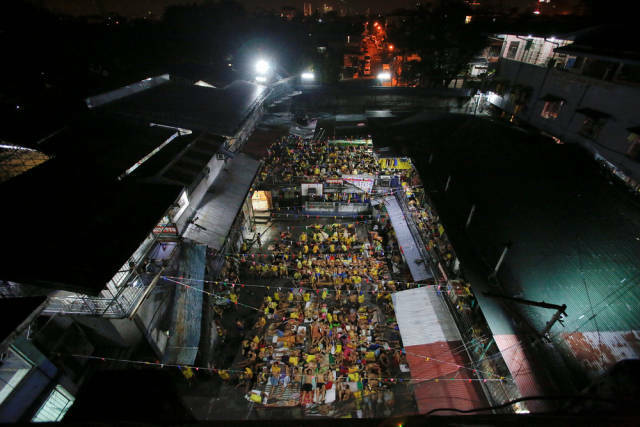 Inmates watch a movie at Quezon City Jail in Manila, Philippines October 19, 2016. 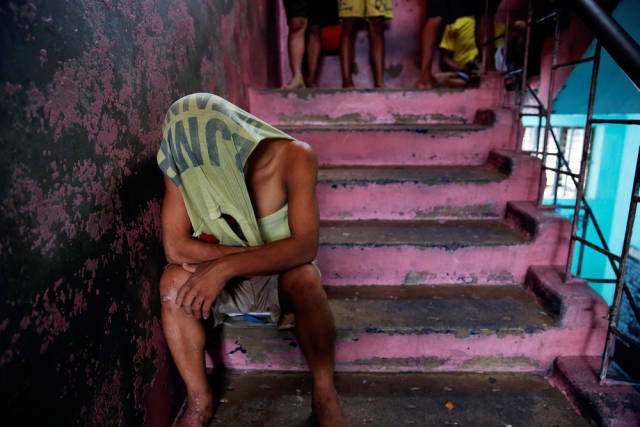 An inmate covers his head as he passes the time inside Quezon City Jail in Manila, Philippines October 19, 2016. 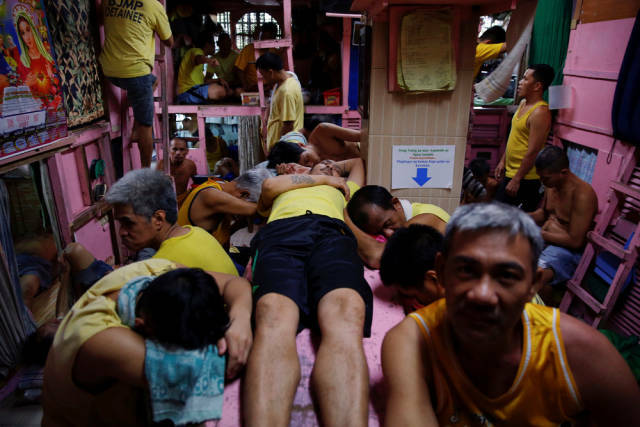 Inmates pass the time at Quezon City Jail in Manila, Philippines October 19, 2016. 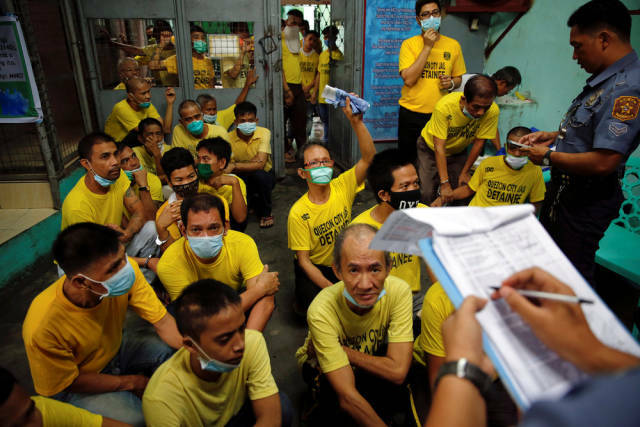 Guards check the lists as inmates are taken from Quezon City Jail to court hearings in Manila, Philippines October 19, 2016. 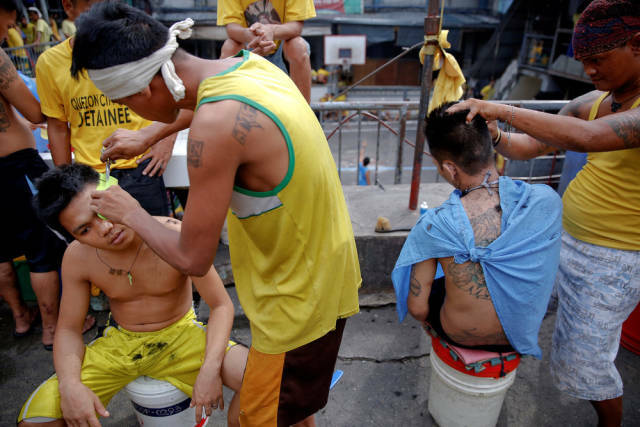 Inmates have their hair cut at Quezon City Jail in Manila, Philippines October 19, 2016. 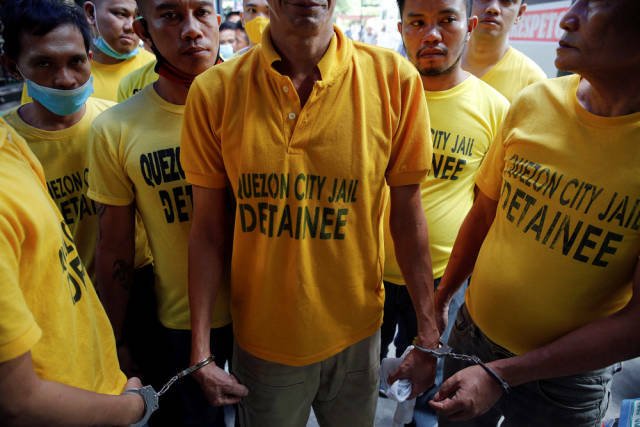 Inmates are handcuffed to each other as guards take them from Quezon City Jail to court hearings in Manila, Philippines October 19, 2016. 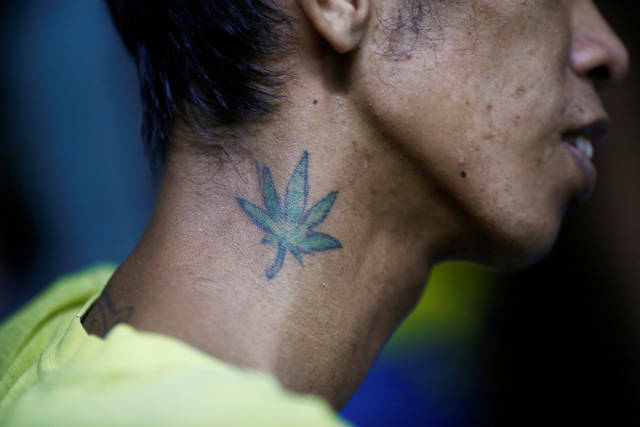 A tattoo is seen on the neck of an inmate in an underground cell of Quezon City Jail in Manila, Philippines October 19, 2016. 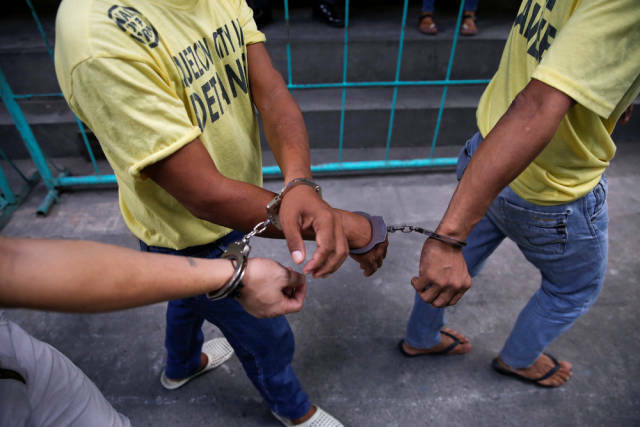 Inmates are handcuffed to each other as they are brought back from hearings to Quezon City Jail in Manila, Philippines October 19, 2016. A cat is tied to the leg of a sleeping inmate inside Quezon City Jail in Manila, Philippines October 19, 2016. 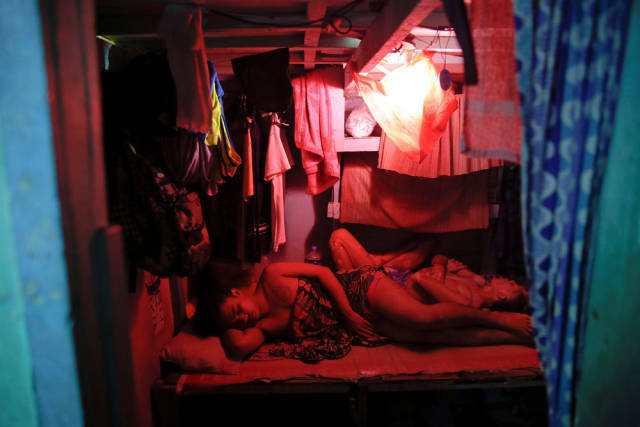 Inmates sleep inside Quezon City Jail in Manila, Philippines October 19, 2016. 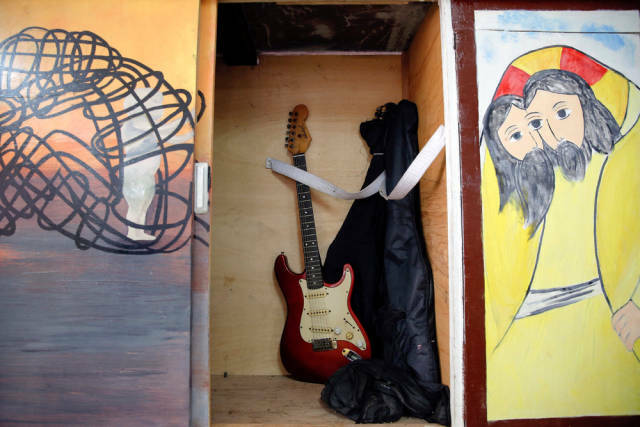 A guitar is placed inside a closet at the chapel of Quezon City Jail in Manila, Philippines October 19, 2016. 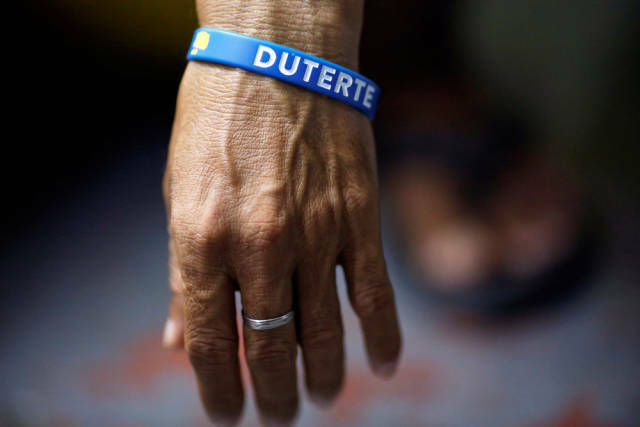 An inmate who is about to be released wears a wristband with the name of Philippine President Rodrigo Duterte at Quezon City Jail in Manila, Philippines late October 18, 2016. 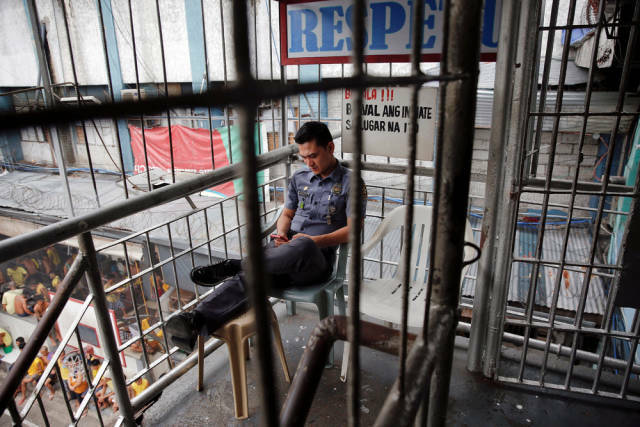 A security guard checks his phone as he watches over inmates inside Quezon City Jail in Manila, Philippines October 19, 2016. 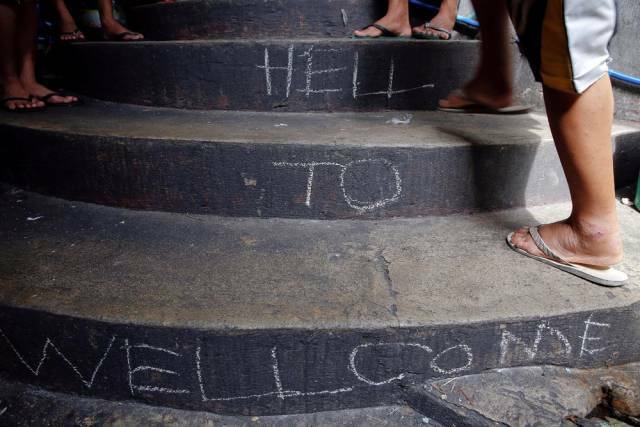 “Welcome to Hell” is written on the stairs inside Quezon City Jail in Manila, Philippines October 19, 2016. Jail is a safe place for any person related to drug in Philippine, most of them simply get shot on the streets, under a consenting silence of the police, if not directly by the police. Duterte annonuced it before he got elected (he previously was mayor of his city and already applied it), and he kept his word. He also claim having killed people himself, called Obama "son of a b***".... And the prinsons you show have now an over-fiilling ratio like 100!